I used to go to a hair stylist when we lived in San Francisco. (NB: When you live in San Francisco – they are stylists – never barbers. But I digress.) Over some years of going to Lisa – I came to know that she was a former Catholic. Religion still tugged at her somewhat. But Lisa wasn’t practicing. She had a sort of left-coast approach to organized religion. Lisa had a thing about angels. She had angels everywhere around her work area. There were angels visible; there were angels partially hidden in potted plants and in wispy material that might look like or actually be referred to as angel-hair. You know the kind of white material that someone might put up as part of a Halloween display? That’s the stuff I’m talking about. And in those areas where Lisa had created some sort of ethereal display, she placed angels. Not that these displays had anything to do with non-corporeal and beautiful, intelligent spirits. No. Lisa’s angels were good mood and good luck and good intention sort of objects. Look at the angels and think good thoughts! We can hold on to that thought, but let’s consider also what our Catholic Catechism tells us: “Angels are spiritual creatures who glorify God without ceasing and who serve His saving plans for other creatures: “The angels work together for the benefit of us all.” (St. Thomas Aquinas) CCC350. Now recently, maybe my Guardian Angel (yes, I believe!) has been helping me to read more and be reminded more of the angels. I may even have more than one angel assigned to me. Not that I’m that special (although I’ve been marked with the sign of ordination as a deacon, thanks be to God!). You may have multiple angels assigned to you as well. I’ve been trying to remember to pray each morning to my angel(s). Help me today. Guide me today. Steer me today. So maybe I shouldn’t make light of Lisa’s angel displays. Because they might be a reminder to remain aware. Awareness of the beauty and the power and the intelligence that is unseen but which remains near us. When I’m pregnant I always love the thought of having 2 guardian angels with me. I had a friend once comment on giving birth and visualizing all the guardian angels in the room celebrating and congratulating her baby’s angel. Maybe that’s placing human tendencies too heavily on heavenly beings, but the thought certainly makes me smile. On a side note my 6 year old came into our entry way after playing outside the other day and with the windows in the house open often when you open one door the one in front of it opens also due to the change in air pressure. This happened to him and the rest of the day he was just tickled thinking his guardian angel had opened the door for him….and maybe he was right 🙂 Lovely post Deacon Tom! Just found this site. Are you kidding me? I have an amazing Guardian Angel. He wakes me up to go to daily Mass. It doesn’t matter if I have been up working as a nurse until 1 AM…I am childlike in my prayers and thank him for being with me as I care for the elderly and pray for those I love. Just celebrating the Archangels yesterday was so special for me in my life. I thought of Jesus suffering in the garden and the tempation as well. 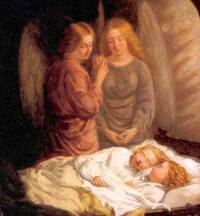 Angels surrounded and served HIM…Our angels are so special….I have the Guardian Angel picture in our grandchildren’s bedroom and I am sure they know their angel watches over them as we pray with them when they visit. Their parents do not say this with them, so this is very special…Thanks so much for your article, Deacon Tom..We believe in our angels and the gift our Lord has given us in them.